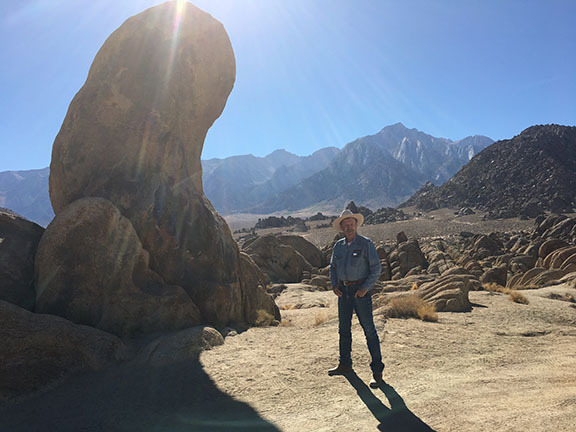 Went out into the Alabama Hills yesterday and got to see the location where numerous Westerns were filmed. One of the more famous outcroppings is known as Gene Autry Rock. 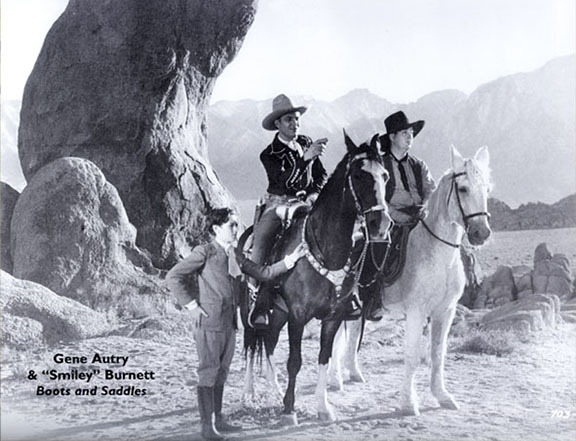 Autry Rock looming behind Gene Autry and Smiley Burnett, filming "Boots And Saddles"
BBB at Gene Autry Rock. 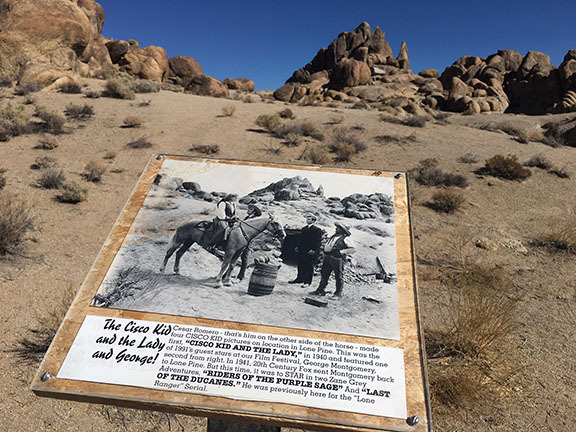 According to an area historian, the Alabama Hills got it's name from Southern, Johnny-Reb miners who, in 1863, discovered placer gold in these hills and named their claim the Alabama, after a Confederate cruiser, then sinking a ton of northern ships during the Civil War. The name stuck and now the entire area is known as The Alabama Hills. It isn't just the scattered boulders that give the area its stunning, photographic charm. The face that rises up behind those boulders is a sheer wall of granite, more than two miles high and 15 miles long. And in the middle of this wall is the highest peak in the lower United States—Mount Whitney, at 14,495 above sea level. Now the weird thing about the stunning face of the eastern side of the Nevada Sierra is that the tallest appearing peak is not Mount Whitney. The Sierra Nevadas across the street from my room at the historic Dow Villa Hotel-Motel. to the right of the tallest appearing peak, Whitney is the one just above the saddle. The name Mount Whitney also has a strange, tortured history. Up until 1864, everyone out here just assumed that Mount Shasta, in northern California, was the tallest peak in the country, but then a geological survey party discovered that several peaks in the Sierra Nevada range were higher. The surveyor who led the survey party was named Josiah D. Whitney and he got the honor of naming the highest peak after himself. But then, people got confused about which peak was actually Mount Whitney (see above photographs), and, in 1873, a trio of fisherman climbed the peak and christened it "Fisherman's Peak." 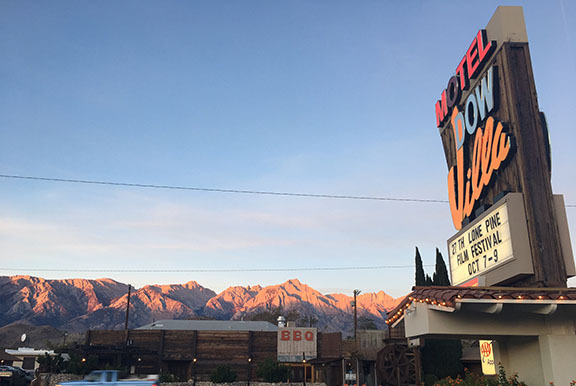 Well, it turns out, the locals liked this name better because of petty resentments about an earthquake investigation that Mr Whitney allegedly bungled, or, rather, under-reported, according to the area residents. So the locals introduced a bill that would change the name from Whitney Peak to Fisherman's Peak, but the governor refused to sign it and Whitney carried the day, to this day. 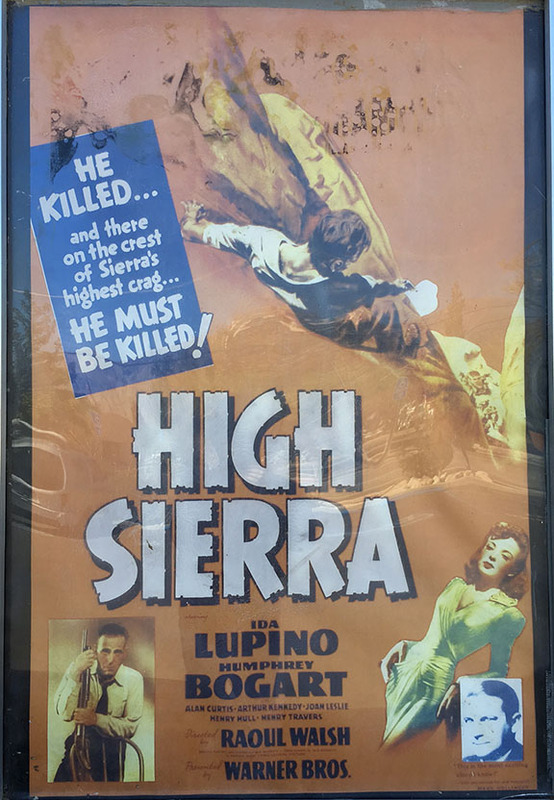 up Whitney Portal Road in the Raoul Walsh directed movie, "High Sierra,"
which made Bogart a superstar. 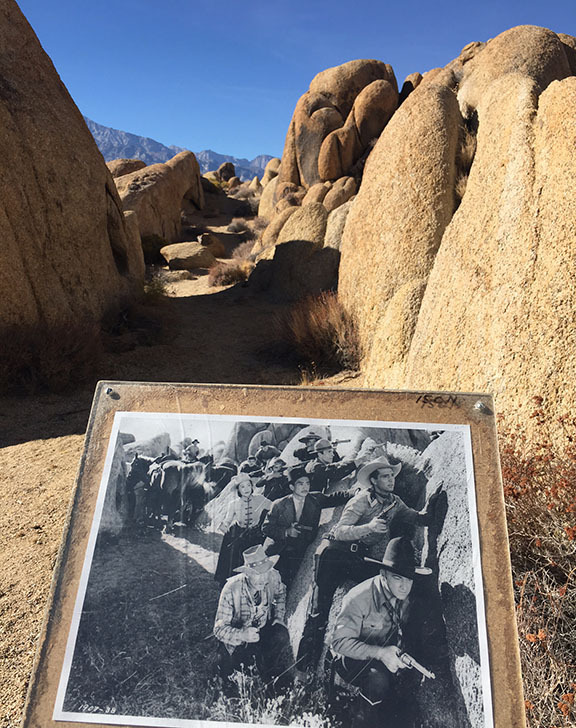 One of the really cool things about the Alabama Hills is that in certain spots there are plaques with a photo showing one of the movies that was filmed on the same spot. Unfortunately, people keep stealing these which ruins it for the rest of us. 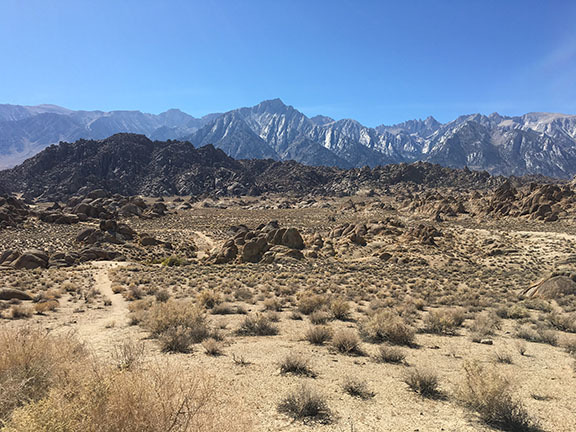 The good news is, every year at the Lone Pine Film Festival they run tours all day, for all three days, with experts taking fans out to the Alabama Hills and showing them exactly where all the classics were filmed. "Story is our only boat for sailing on the river of time." Why Did Mike Lacey Give Me $5,000?